Man or devil, Spring-Heeled Jack cut a swath of terror across 19th-century London. In Victorian England, the scariest boogeyman was a fire-breathing devil-man who could jump unnaturally high. Some said he was demon, while others thought he was just an extraordinarily agile human, but no matter what you believed about the legend, Spring-Heeled Jack was a name that inspired fear among the folk. His name survives today mainly in the form of plays and references in various forms of media, but his legend still holds a bit of the original creep factor it had when it first bubbled up out of the public consciousness. Mainly attacking women, the figure/monster would ring a doorbell, and when someone would answer, it would ravage their clothes with its claws. Other sightings have him simply ambushing people who were out walking. Similar reports continued to trickle in throughout the rest of the year, with strange crimes being attributed to assailants in the guise of a ghost, a bear, and/or a devil. These disparate reports would eventually lead to the theory that this mysterious monster might have been a group of well-to-do men dressing up and scaring people on a bet. Others reported the figure as wearing red shoes, or armor. The descriptions were all over the place and so outlandish that when these tales hit the pages of the major London papers, Dash notes that most of the press was rightfully skeptical. The lord mayor of London, John Cowan, even came out in January of 1838 to address the growing number of stories, bringing up the theory that the attacks were perpetrated by a gang of wealthy jerks. However, that didn’t stop the legend from growing, and as the papers reported more accounts, the devilish figure came to be called Spring-Heeled Jack, as many of the reports involved the creep leaping in front of or away from his victims in such a way that no mortal man would be capable of. Jack really took shape after two of his most well-known attacks. 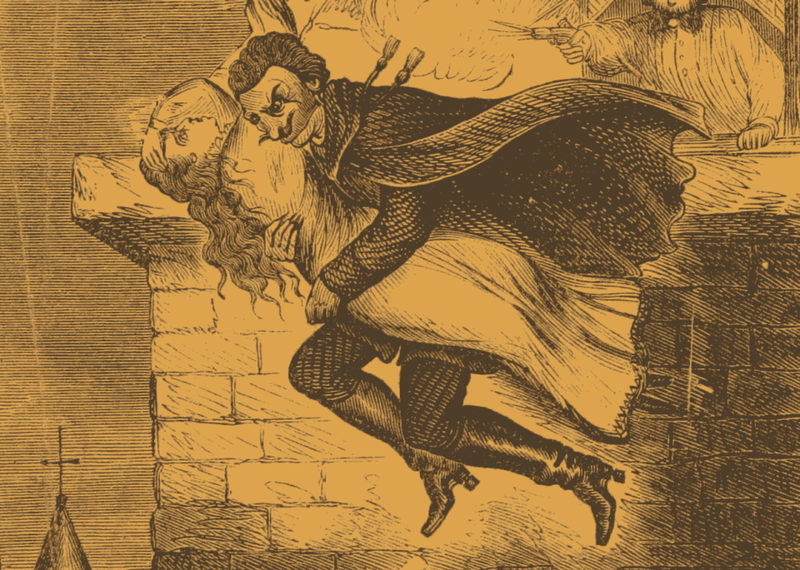 According to an account that was widely publicized at the time, in February of 1838, a man rang the doorbell of Jane Alsop, screaming that they had caught Spring-Heeled Jack and that they needed help. When she brought the man a candle there in the dark street, he proceeded to breathe blue flame in her face and tear at her clothes and skin with metal claws. She ran back toward her house, but he continued to cut her with his claws, until Alsop’s sister came to her rescue, scaring off the attacker. Alsop described Jack as having eyes like red fireballs and wearing a helmet and tight-fitting white outfit. It was a bizarre account, but Spring-Heeled Jack’s reputation as some kind of devil grew. Just days later, another attack took place in a different part of London. Lucy Scales was walking with her sister when a shadowy man jumped out and also allegedly blew blue flames into her face, causing her to have some kind of seizure. While many of the initial reports of Jack’s attacks took place in outlying hamlets and villages, both the Alsop and Scales cases took place closer to the city and received a great deal more attention, stoking the fires of Spring-Heeled Jack’s legend. Their testimonies also informed what would become his popular look as a gentlemanly devil figure. After the attacks and attention given Spring-Heeled Jack in 1838, the figure became a popular boogeyman across England. He became a character in a number of cheap penny dreadfuls, many titled, “Spring-Heeled Jack, the Terror of London,” where he was alternately portrayed as everything from a jilted brigand to a supernatural menace. All of these depictions just served to cement his boogeyman status. Parents would tell stories of the jumping devil to scare their kids into submission. Mysterious unsolved crimes would be attributed to Jack by sensationalist reporters looking to sell papers. This elusive monster now belonged to Victorian nightmares. 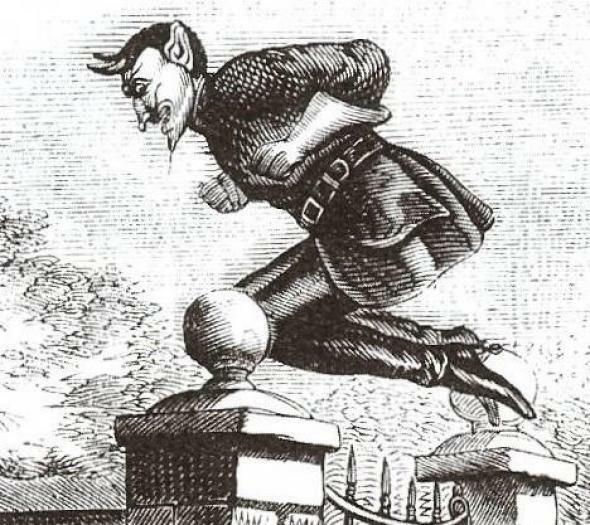 Eye-witness reports of Spring-Heeled Jack continued popping up all over the country, if less frequently and from much less substantial sources as the spate of occurrences in 1837–38. Copycat attackers were captured here and there, trying to take advantage of the legend. The mischievous devil made a series of appearances at the Aldershot military base, where he harassed and terrified sentry guards in 1877. Then in 1904, Jack made what is considered his last confirmed appearance in Liverpool, where he was witnessed leaping up and down the street before jumping onto the rooftops and bounding away forever. But even if official sightings of Spring-Heeled Jack have stopped, his legend still survives. Characters inspired by Spring-Heeled Jack can be found from steampunk novels to mainstream comic books. The conspicuously Victorian air of the gaunt, springing devil continues to evoke the era in which his legend grew, making him a popular template for scare stories. Although today we might remember his name, for better or worse, Spring-Heeled Jack may never again inspire the kind of terror he once did.